One of the worst things that can happen when you’re ready to cook a delicious meal or bake a tasty treat, is noticing that your oven won’t turn on at all. 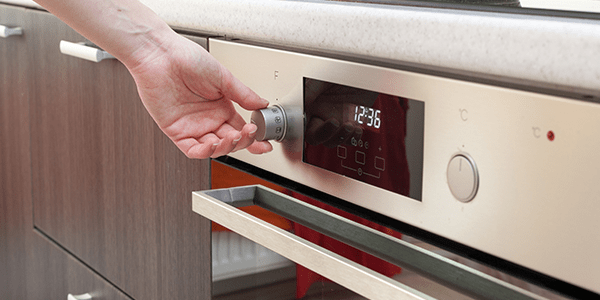 Some common causes for an oven not turning on need to be repaired by a professional, but others can be fixed if you’re a little handy. Use our troubleshooting guide to determine if you can DIY or need to call an oven repair technician. What it is: This basically refers to the electrical outlet that your oven is plugged in to. Electric ovens need 240 volts of alternating current in order to work, and gas ovens need 120. How it fails: If your oven won’t turn on, there may be an issue with the outlet. Insufficient voltage from the outlet can cause this common oven problem. How to Diagnose it: Use a multimeter to determine if there is proper voltage coming from the electrical outlet. What it is: There are multiple wires that supply the oven with power. They are responsible for igniting the heat and turning the oven on. How it fails: Wires near the heat source can often burn out, leading to your oven won’t turn on issue. How to Diagnose it: Take a look at the wires that lead to the igniter or heating elements. You will see physical damage if the wires are burned out. Replace them as necessary. What it is: The oven control board sends voltage to the bake and broil circuits via relays. This is determined by user settings and sensor input. How it fails: A defective board will not send voltage to the heating elements, making it appear that the oven isn’t on. How to Diagnose it: We recommend testing other components first. If all other parts appear fine, the control board may need to be replaced by a professional. What it is: The thermal fuse in an oven acts as a safety precaution against overheating. It will trip if the oven temperature gets too high. How it fails: Sometimes the fuse will blow, then your oven won’t turn on. How to Diagnose it: You will need to test the fuse for continuity with a multimeter and replace it if none is found. The fuse cannot be reset. What it is: The igniter works to draw current through the safety valve and open it. It also heats up and ignites the gas in the burner. How it fails: When you have an oven not turning on, it is likely due to an igniter issue. It can get weak after heavy use, failing to open the safety valve correctly. This causes the oven not to heat. How to Diagnose it: If the igniter glows longer than 90 seconds without igniting the gas flame, it is too weak and will need to be replaced. Learn about other common oven problems here, or contact ABC Appliance Service for professional oven repair.